I am dying to get on the water. I’ve hung out with other athletes a whole bunch over the last few months – and I want to be in the game again. It is so cool to hear firsthand accounts of star triathletes cross-training with star kayakers in Hawaii, hearing stories of four-hour rides around the big island or dangerous paddles on the open ocean. I want back in! 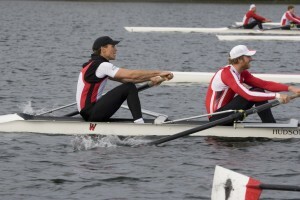 My cousin James is working hard to earn a spot on the Canadian Rowing squad. There’s nothing glamorous about rowing through the winter on Elk Lake – especially not on snowy days like today (March 9th). He’s out there though, day in and day out. He’s unable to train full time because he has to support his habit by working – but he IS out there. I think it’s because of hard conditions like cold winters and athletes being poor that make Canadian athletes succeed. It’s just the contrast at the big show from these Spartan training conditions that cause a bit of culture shock when the lime light is directed at them. James had a disappointing 6K test this morning, but what he doesn’t see is the big picture: he is laying the groundwork that will get him on the podium in three and 1/3 years. This far out you can count by years, especially when you are not in the thick of training, like me. What I would give to be able to race a 6K test today (good, bad or ugly). Balance is always hard to find. It takes great focus. The better you want to be at something, the harder it is to find balance. Ever hear about the 20/80 rule? Well, in my amateur athletics reality it is more like the 5/95 rule. It takes 95% of the time, energy and effort to gain that last 5% of speed – but it is that last little bit that would have made the difference for me in Beijing. And the way you gain that last little bit is by working your tail off the way James and the other 11 guys are doing out on the lake today, the way Simon is every day, the way Adam is, and the way I have not been. Did I learn my lesson or not?